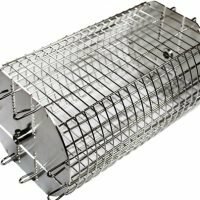 This 53 inch heavy duty stainless steel grill rotisserie kit embodies the best there is to offer in rotisserie grilling. Featuring a strong rotisserie motor capable of turning loads up to 60 pounds* and an ultra heavy duty 5/8″ hexagon spit rod, this kit will be the perfect match to your larger load rotisserie needs. 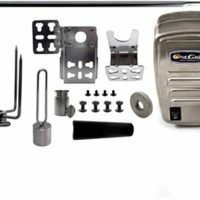 The entire kit is constructed of rustproof 304 stainless for countless uses and an unsurpassed lifespan. 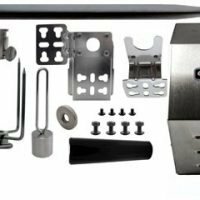 This grill rotisserie kit comes complete with continuous duty heavy duty rotisserie motor, a 53″ X 5/8″ hexagon 304 stainless steel rotisserie spit rod, a 304 stainless steel universal mounting bracket set, a set (2) of 304 stainless steel four prong offset rotisserie spit forks, a 304 stainless steel adjustable ride bushing, a fully adjustable 304 stainless steel counterbalance system, and a premium insulated handle. 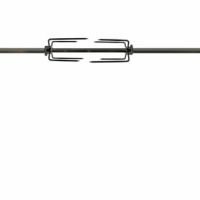 Please note that the total length of the spit rod is 53″ long and is generally ideal for applications up to 47″. 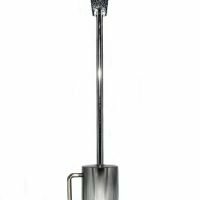 Designed and engineered to be a lifetime product on your grill Includes our strongest grill rotisserie motor (110 volt) Includes 53″ X 5/8″ stainless steel hexagon rotisserie spit rod with standard 5/16″ drive end Includes universal mounting brackets Includes fully adjustable 4 prong offset rotisserie forks Includes fully adjustable counterbalance system Includes adjustment bushing for added adjust-ability Includes high quality molded plastic handle All metal components are 304 stainless steel construction *Weight capacity is an estimation based on a perfectly balanced load. Loads beyond 60 lbs. need to be evenly distributed across the spit rod to avoid and eliminate excessive bowing and deflection.